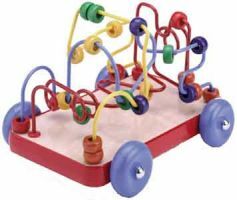 The Maze On Wheels toy encourages children to develop eye-hand coordination while having fun! With a variety of paths available, kids will enjoy pushing and pulling the round pieces over and under. So encourage your child to fine-tune their motor skills by participating in imaginative play with the Maze On Wheels. Ages 2+.